(Kenora, Ont.) Anishinaabe and #Two-Spirit poet, Sydney Flett, whose mother is from Wauzhushk Onigum First Nation, Ontario and father from Wuskwi Sipihk First Nation, Manitoba, recently launched a new collection of Two-Spirit poetry titled, Cusp of Brilliance. This new collection of Two-Spirit poems is a personal reflection of the intersection and relationship between Sydney’s Anishinaabe identity and being Two-Spirit. “This project started as a magazine, but my computer crashed and lost my some of my work. I salvaged what I could, and what was left was a book of poetry,” Sydney told the Two-Spirit Journal (2SJ). Sydney is an active and engaged community member who volunteers and helps organize Kenora PRIDE as well as their local LGBT2S+ youth peer support group called SPACE. Sydney organized an event for local Two-Spirit community members to hear some of teaching and creation from Knowledge Keeper Ron Indian-Mandamin. Sydney also assisted in planning a week-long Two-Spirit youth camp in Wabaseemoong First Nation last year. 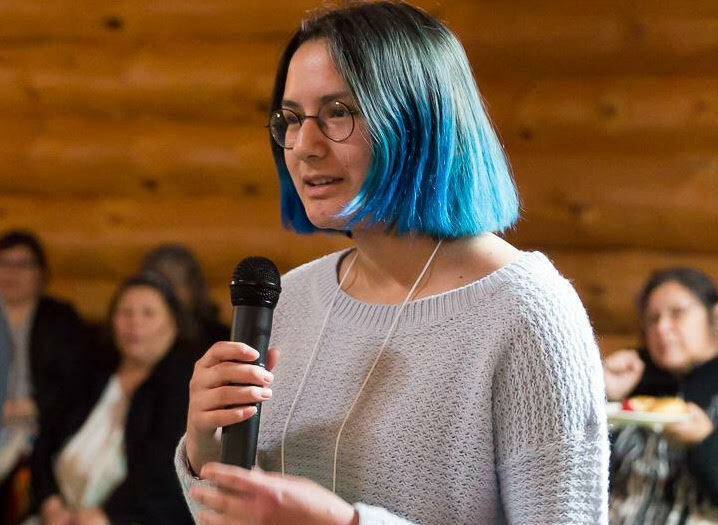 Sydney is a member of the Obishkinigiig Youth Executive Council for Grand Council Treaty 3, the Wiisokodaadiig Youth Council for Kenora Chiefs Advisory, and served as a member of the Minister’s Student Advisory Council for Ontario. For the last two years, Sydney has been an administrative summer student for Seymour Law office, before that Sydney worked for Kenora Chiefs Advisory as a youth co-facilitator for their Biizindadedah Family Parenting, a partnered program with McGill University. Sydney also started a First Nations, Metis, and Inuit leadership team at Saint Thomas Aquinas high school in Kenora where Sydney just graduated from. Presently, Sydney is settling into Trent University, as a first year student in the Indigenous Bachelor of Education program. Sydney shared the following two excerpts, “they sort of go together, showing the transition I went through emotionally and spiritually,” said Sydney. For a copy of the book, contact Sydney Flett at sydneyflett@hotmail.com, and tell Sydney that 2SJ sent you! I slipped into a daze of death and destruction. of what was happening you were drowning. the constant news of death coming in waves. before you are numb to it. that there is something very wrong about that. Then, the destruction comes from within. so others don’t have the chance. knowing damn well what it will do to you. in bad taste I might add. and found my way to the opening.